hazard lights | WorstPlans.com updates every Monday! Every vehicle has two turn signals on the back. 1) Car is turning left / right. Fig 1: The emergency / hazard lights are usually activated by this button. Unfortunately, distinguishing between the “turn signal” and “emergency” requires that both lights are visible. See figure 2 for a common example involving a bus that is either stopped at a bus stop (and thus it is safe to go around it to the left) or is signaling that it is about to get into the left hand lane (and thus it is not safe to go around it to the left!). Fig 2: The scenario in question. 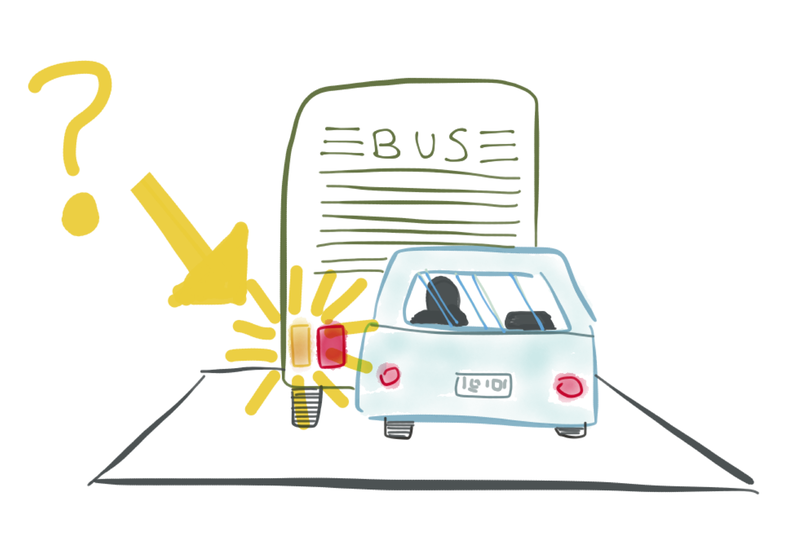 The bus’s right-side turn signal is blocked by the blue car. So if you saw this scenario in front of you while driving, you wouldn’t know what the bus was planning to do (Remain stopped? Move into the left lane? Who knows!). The solution to this issue is very simple: normal turn signals typically blink with approximately equal time in the “on” and “off” portions of the cycle. We would keep this behavior the same, but change the “hazard light” blinker pattern to a different pattern (for example, two short blinks, followed by a longer pause). See figure 3a for a current normal blinker’s behavior, and figure 3b for the proposed revision to emergency lights. Fig 3a: A standard blinker typically blinks on and off in a regular pattern. The “on” and “off” periods usually take the same amount of time. Fig 3b: In the proposed change, emergency lights would blink in a distinctive “on / off / on / off (long pause) on / off / on / off” pattern. This way, even viewing a single blinker would be sufficient to tell if the vehicle was signaling to change lanes or if it had its emergency blinkers on. This would probably work! And it does not require any additional hardware in the car (i.e., no additional lights). It would probably add zero cents of cost to the manufacture of a new car. PROS: Easy to implement, probably would work!